"...we want you too to walk with them!" At Soldiers to Summits mountains serve as both metaphor and training ground for stretching goals, building world-class teams, innovating through adversity and stepping up to lead and serve others. The summit often appears insurmountable at first glance, but participants learn to dig in and take the journey one step at a time. All those steps add up. Between now and September 12th the Mission: Mount Whitney team will log hundreds of miles in their boots. Footwear sponsors like La Sportiva and Teva enable our soldiers to press forward against the odds. We had two criteria in mind in selecting a boot for the Mt. Whitney team: durability and versatility. The Karakorum by La Sportiva fits the bill, and then some. La Sportiva still makes most of their boots at a small, 150-person factory in Italy, where a tradition of quality is the standard. With a leather upper and high-density Nylon insole, the Karakorum stands up to abuse on the trail, day in and day out. In terms of versatility, the Karakorum is constructed for a range of climates. It is crampon compatible, proving its worth amid snow and ice on St. Mary’s Glacier, but also breaths wonderfully on warm days. We were fortunate to have a professional boot fitting donated by Bent Gate Mountaineering in Golden, CO to ensure proper fit. 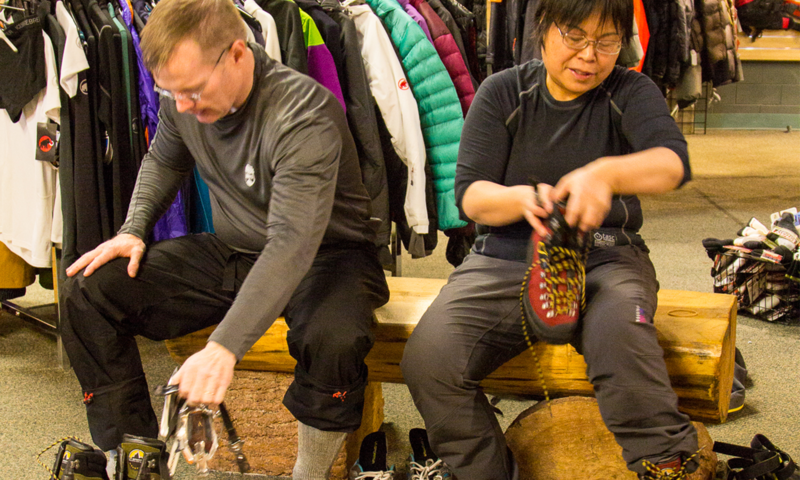 “Helping these veterans with the fitting of their boots is our way of participating and showing our support for this amazing journey,” said Greg Floyd, owner of Bent Gate Mountaineering. Bent Gate first learned about Soldiers to Summits through Golden and blind adventurer Erik Weihenmayer, who led the first S2S expedition in 2010. Back at base camp on Mt.Whitney, our team of soldiers will slip into the comfort of Teva Original Sandals. Honoring the very first Teva sandals ever made, this model has traditional nylon webbing and durable rubber outsoles, making them as valuable today as they were 30 years ago. They are light enough to throw in a pack but also provide stability for river crossings and late night bathroom breaks. At the end of a long day on the trail, Teva sandals are a soldier’s best friend. While the soldiers will be walking 25 miles from base camp to the summit and back down to the trailhead, we want you too to walk with them! Walk with the Soldiers is a grassroots fundraising campaign created to ensure that our soldiers are not taking their journey alone. Sign up today by pledging to raise money for No Barriers programs like Soldiers to Summits and walk 25-miles in their footsteps!